Our naturist club and campsite is set in tranquil grounds in Aparima in rural Western Southland, approximately 60 kms from Invercargill, and 10 kms from Otautau. You're welcome to visit our club, whether you're a naturist from one of over 20 naturist clubs and resorts throughout NZ, an international naturist, or a genuine local considering the freedom of the naturist lifestyle. it's important that you contact us first, since if there are no members on site, the gate and buildings will be locked. Contacting us prior to visiting ensures a club member can meet you there to provide access and show you around. 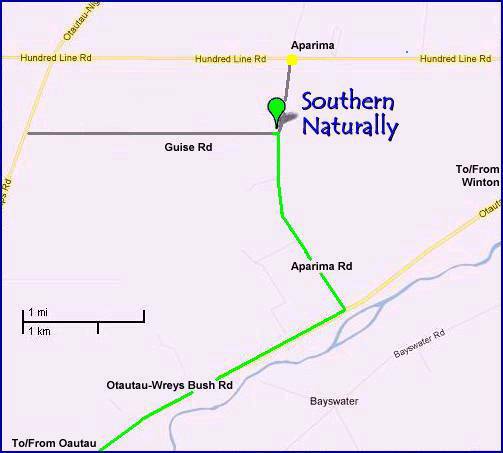 Southern Naturally is on the corner of Guise Rd and Aparima Rd, Rapid No. 329, and occupies what was once the Aparima school grounds. The maps below show, in green, the easiest route from Invercargill to the club. This journey would take around 50 mins. Of course the club is easily accessed from other directions as well. If you are a visitor to Southland, do not be led astray by road signs and map references to Aparima mentioned in conjunction with Riverton. Aparima is the Maori name for Riverton, but the Aparima you want is near Otautau. You need to travel towards Otautau, passing through the township if coming from Invercargill, and then head north-east towards Wreys Bush. 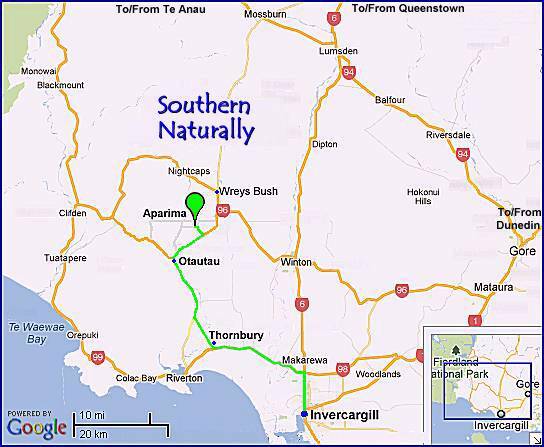 10 kms from Otautau on the Otautau-Wreys Bush Rd you need to find and turn left into Aparima Rd, an unsealed gravel road. 2.5 kms along on the left is Guise Rd. The first gateway immediately around the corner is 329 Guise Road, home of Southern Naturally.